I blame Mickey Mouse, or should that be Mickey le Souris? It seems to me that ever since Tinkerbell opened those fairytale gates to Euro Disney, sorry…Disneyland Paris in 1992, something has been happening to France that far from enchanting the visitor, is turning the magic of France into something, dare I say, a little tawdry. Don’t get me wrong, I love France and have been several times and as I have mellowed over the years and come to ignore le rosbif gibe, I could quite see myself living there, but the magnificent chateaux & exquisite gardens that were once the lifeblood of the French aristocracy, who had their lifeblood removed by Madame Guillotine, and that once demanded the attention of every visitor, both home grown and foreign, have been usurped by young wiper-snappers in the guise of extravagant galas and exuberant fiestas. 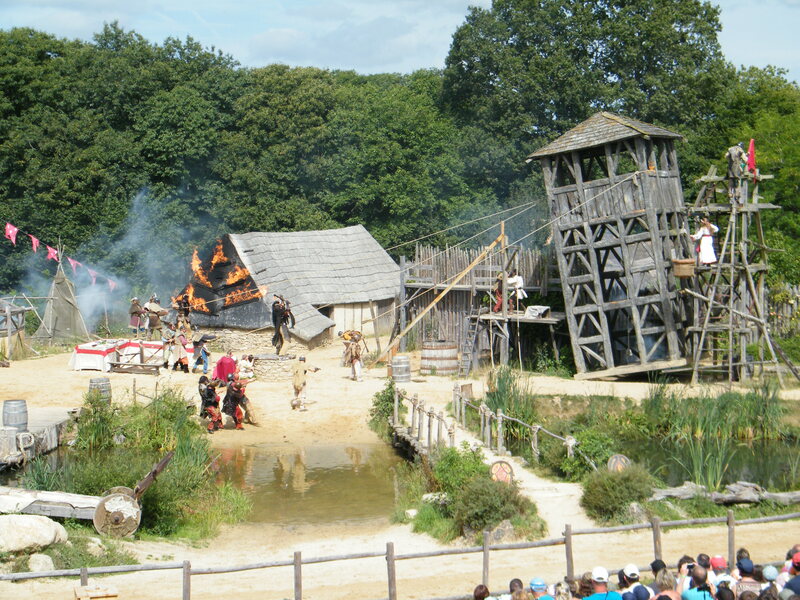 However, I digress from the purpose of this post and that is the Grand Parc Puy du Fou that you will find on the west coast of France between Cholet, Poitiers and La Roche-sur-Yon. When I saw the pamphlet, I tarred it with my ‘it will probably be rubbish’ brush, but the internet said otherwise so we decided to go. Initial reaction to the parking area was my tarring was spot on, it was a dirt track to a large field. Then a bus journey to the Park and 92 Euros (19/child & 27/adult) later we were through the main entrance with the invaluable ear phones that would translate each show into English. 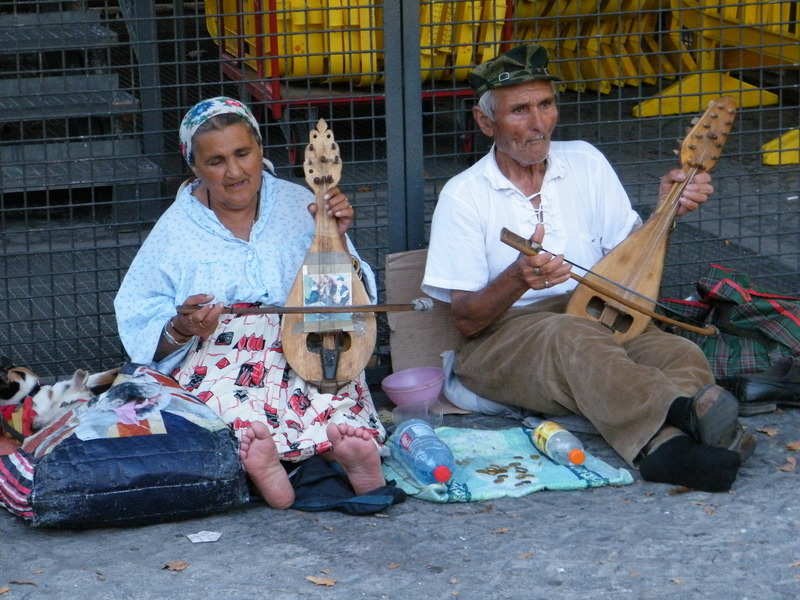 Our first stop was The Secret of the Lance; earphones in and the entertainment began. 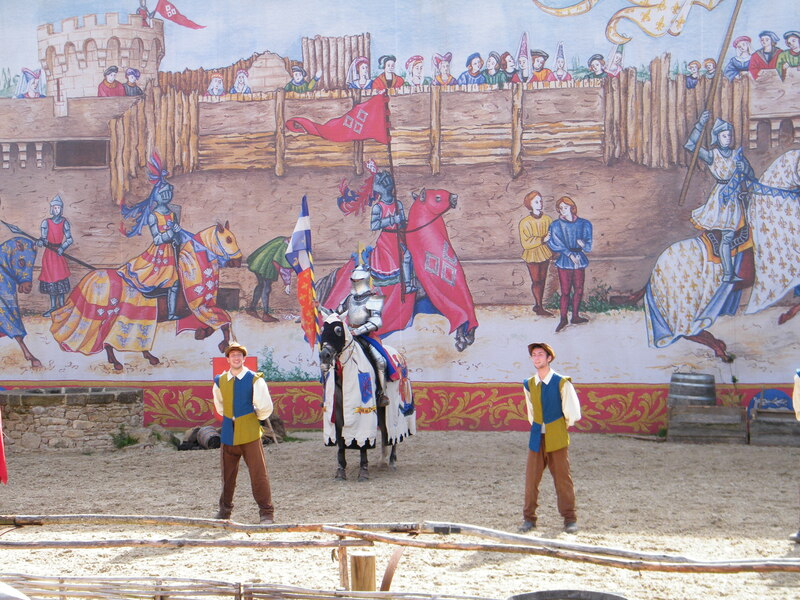 The theme is a “medieval chivalric extravaganza” and it starts with the ‘court jester’ who performs various warm-up acts to get us in the mood. 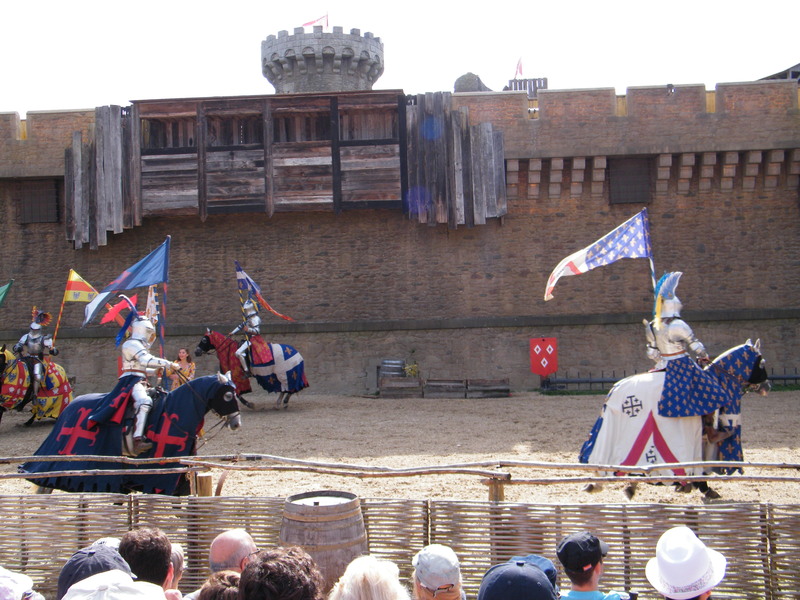 There follows a very well rehearsed and colourful jousting tournament. 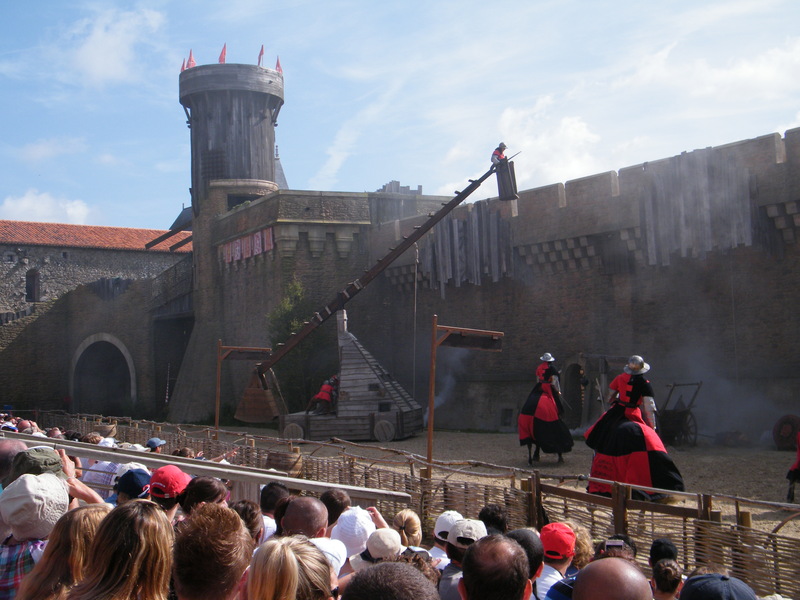 I have to say I could quite understand how the medieval crowds were aroused by the spectacle; their theatrics were very clever and you felt compelled to choose a side. There was also the additional battle that ensued with explosions, smoke, buildings destroyed and a great deal of chaos. 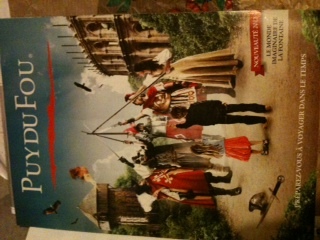 So certainly a good start, our appetite for extravagant entertainment now whetted. 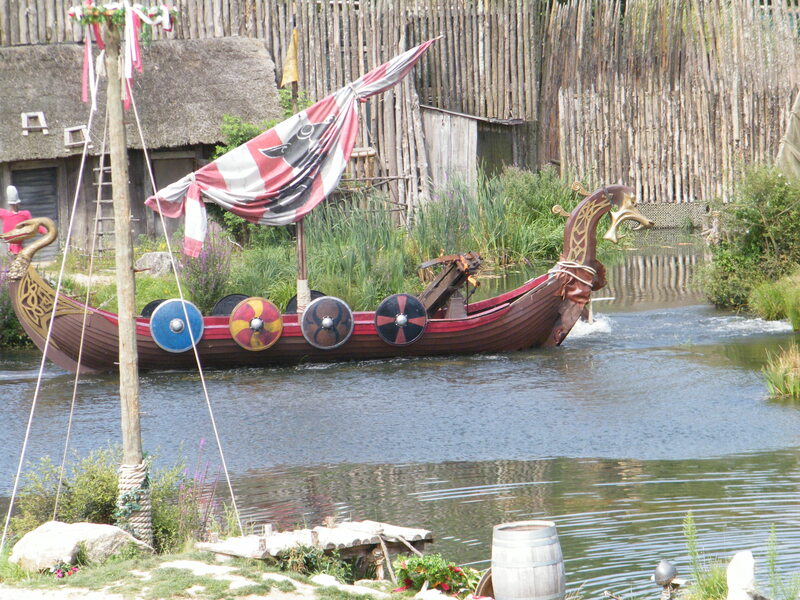 Next stop were those well known French ancestors, the Vikings. Now it’s worth adding an NB here. There were a great many people at the Park, many of them native French and not being English, the thought of forming an orderly line was incomprehensible, thus the eager throng to enter each arena was more of a jostling mêlée than a disciplined queue. However, my NB is this – if you want to get to the front of the crowd, take a wheelchair and plonk someone in it, then ensure you have every member of your party close by. It is not just the wheelchair user who has priority but every person that is related or a friend of said user! The story was again one of battle, bravery and brotherhood with a wedding as the opening scene, followed by a dramatic battle with ships sinking, huts burning and herds of animals running around. There was also a gigantic eagle of some sort that regularly swooped over the crowds, screeching as it did so just in case anyone had nodded off! 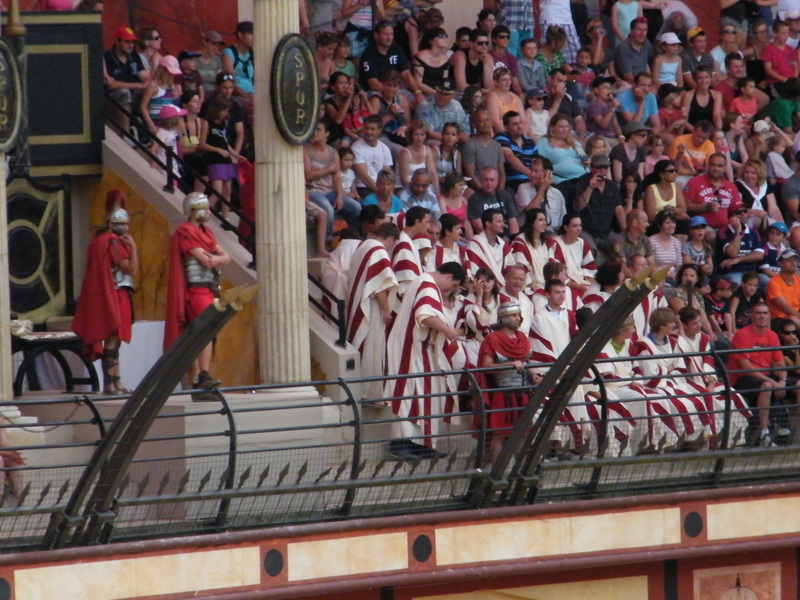 Now for those of you who have ever wondered what it was like to be a spectator in the stalls of the Roman Coliseum, wonder no more. 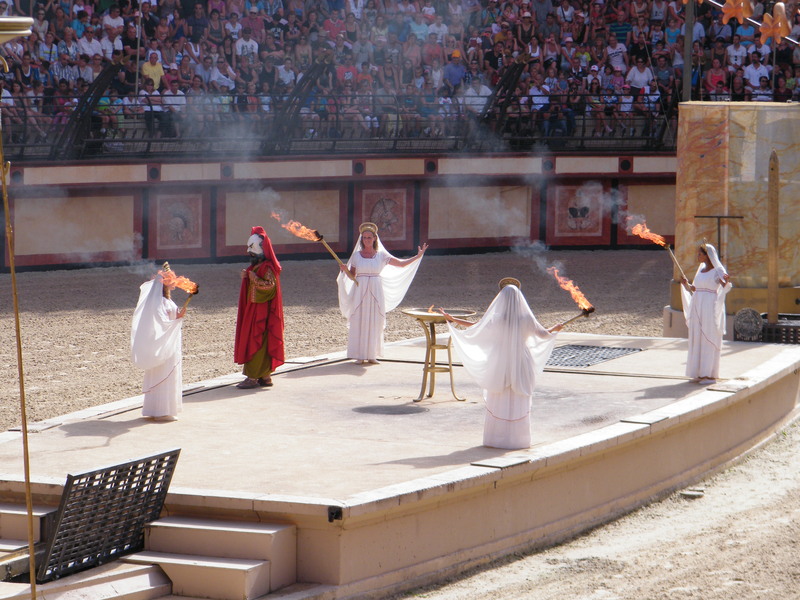 For the uninitiated and lowly peasants, you choose the seats with the best view but soon realise those seats have virtually no shade, so you burn while Roman gladiators fiddle in the Triumph’s Sign. I had high hopes of this performance, but I was sadly disappointed. 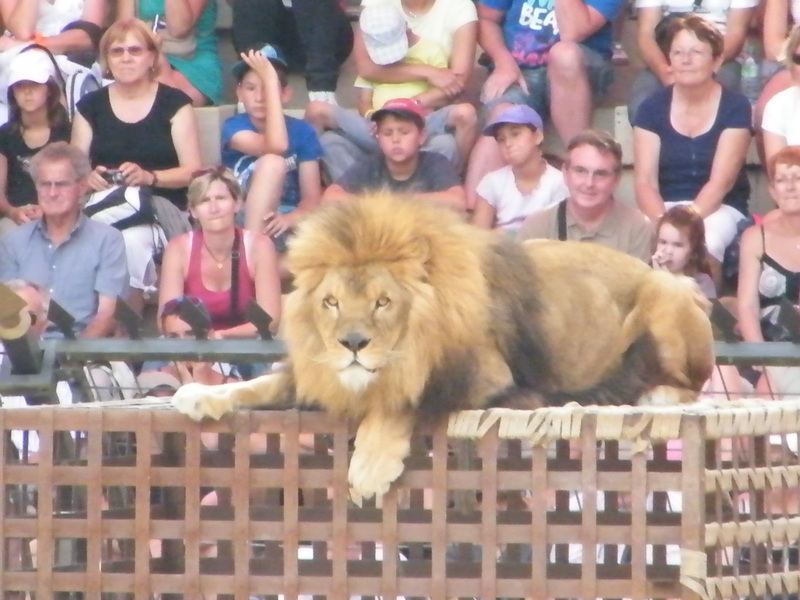 The chariot races were both exciting and well rehearsed and the threatened sacrifice of the vestal virgins was high drama, however my enthusiasm waned when full size lions were brought into the ring and I can but imagine how they had been trained to lie still and roar when directed. 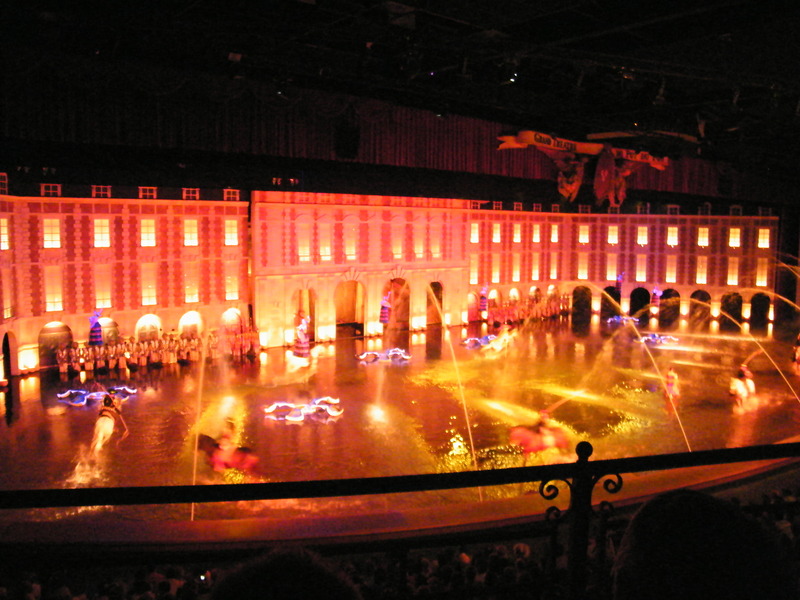 Other shows included the Richelieu’s Muskateer theatre with horse riding acrobatics, sword fighting and flamenco dancers. 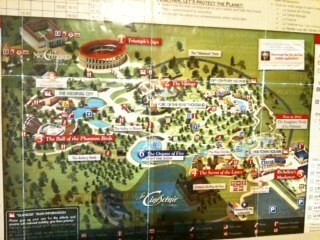 There were various themed villages and exhibitions to enjoy and we didn’t manage to see everything in our one day. Of course the ubiquitous gift shop was there jam packed full of tourist junk. So did it meet my expectations and did we enjoy it? I would say yes on both counts. It was unexpected but only because I still think of France in revolutionary terms, with its Bastille, chateaux, grand aristocracy, Madame Guillotine and revolting peasants. 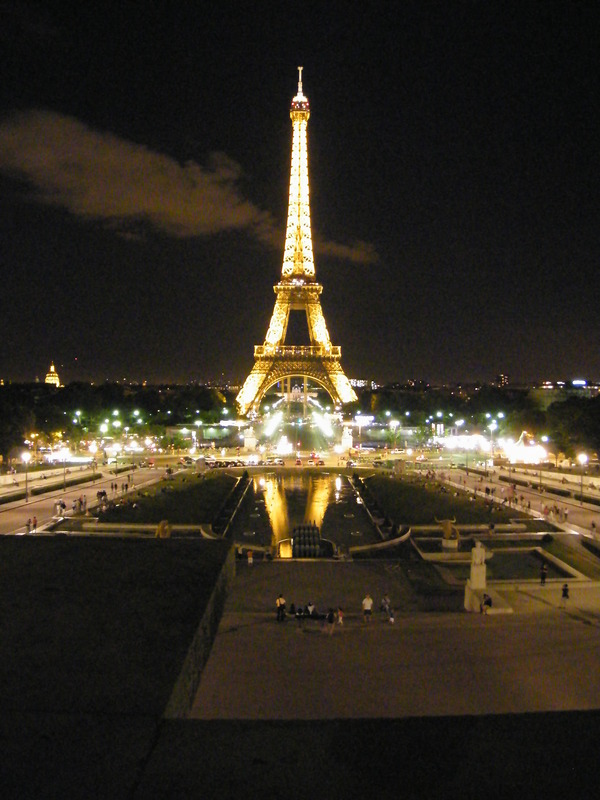 But there was something about it that just didn’t sit comfortably with me, perhaps it’s the inevitable invasion of high rolling investors who are only too happy to pander to our ever demanding needs, I don’t know; I can’t help but wonder if the Disneyfication of France will eventually make it into a less distinguishable country. 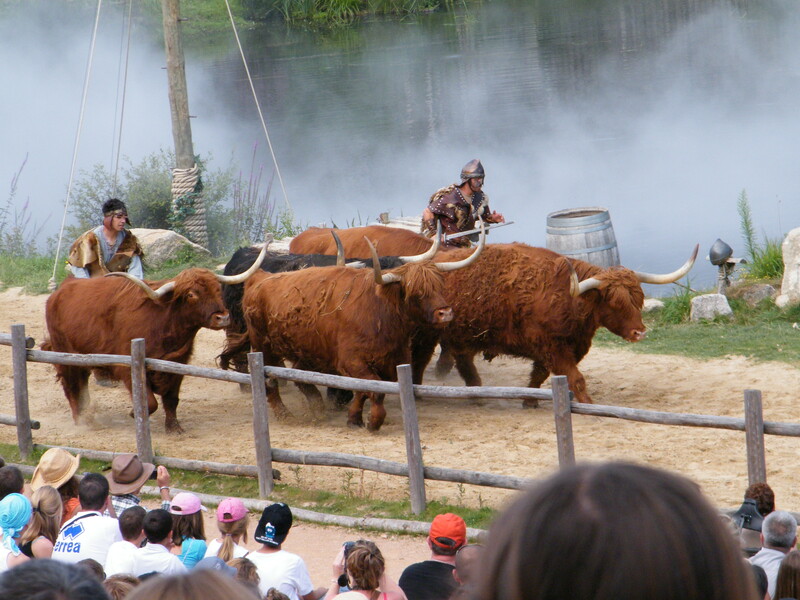 This entry was posted in Holidays & trips away and tagged entertainment, France, French, gladiator, grand parc puy du fou, holiday, horse, lance, musketeer, park, Puy du Fou, Roman, show, viking. Bookmark the permalink.